The Catholic Church celebrates this solemn entry by the blessing of palms and the procession on Palm Sunday. In the course of the High Mass the history of the Passion as related by St Matthew is read by the celebrant and sung by the choir. During the blessing of the palms the priest prays that God may preserve from sin and danger those who receive those palms and keep them in their houses. The week following Palm Sunday is called Holy Week. 2. On Holy Thursday evening Christ ate the Pasch with His disciples, instituted the Blessed Sacrament, and then went out to the mount of Olives, where He suffered His agony and bloody sweat. Before the institution of the Blessed Sacrament He washed the feet of his apostles to teach us humility. His conduct in the Garden of Gethsemane was a lesson of humble prayer, conformity to God's will, and patience under suffering. In the words of St. Ambrose" The Lord took my griefs on Him that He Might share His joys with me". In many places it is the custom to ring a bell at eight o clock in the evening to recall the agony in the garden. The following ceremonies are in more general use: The Pope washes the feet of 12 priests - a practice kept up since the time of Gregory the Great. During the Gloria in the High Mass all the bells are rung, and the priests and laity go to communion to commemorate the institution of the Blessed Sacrament. 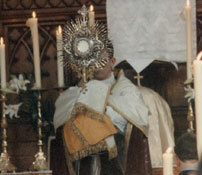 The procession of the Blessed Sacrament to the altar of repose is to recall Our Lord's journey to the Mount of Olives. The stripping of the altars and the silence of the bells are signs of the church's sympathy with her Saviour. Christ was seized by the soldiers in the garden, led before the high priest and condemned to death. 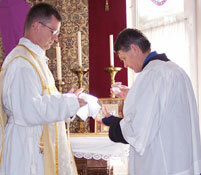 On the Wednesday, Thursday and Friday of Holy Week, Tenebrae is celebrated in the evening. On a triangular frame in front of the altar there are placed fourteen candles of unbleached wax, and at the upper angle one of white wax; the white candle represents Our Lord and the unbleached candles his apostles and disciples. At each of the antiphons which recur at regular intervals during the recital of the psalms a candle is extinguished to represent the flight of the disciples after the capture of Our Lord. 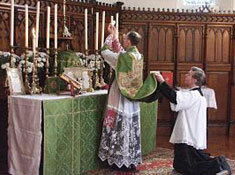 At the end of the service the white candle is hidden for a time behind the altar, a noise is made and the candle replaced on the stand; all signifying the death and resurrection of Our Lord with the accompanying convulsion of nature. From the court of the high priest Christ was led by the Jews before Pontius Pilate, to receive the ratification of the death sentence. The Jews had no power to put anyone to death, so they were obliged to have recourse to the Roman Governor. Pilate could see no reason for condemning Christ, and made several attempts to set Him at liberty; he sent Him to Herod and offered to give up Barabbas in exchange; to enlist the sympathy of the Jews he caused Our Lord to be scourged and crowned with thorns and in that state to be presented to the crowd, but they clamoured only the more for the blood of Jesus, and threatened to accuse Pilate to the Emperor. Pilate, alarmed by the threats of the Jews, condemned Our Lord to the death of the cross. 3. On Good Friday at noon, Christ was nailed to the Cross on the hill of Calvary, just outside Jerusalem and died on the cross about three o'clock. Cicero is our authority that crucifixion was at that time the most shameful and terrible of deaths, to which none but the greatest criminals were subjected. 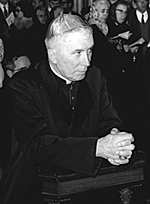 Hence the doctrine of the Crucified was a scandal to the Jews and folly to the heathen (1 Cor. i.23). Yet today the cross is the badge of honour, worn in the crowns of kings, and on the breasts of men proud of the decoration. In the words of St Athanasius sin was repaired on the tree where sin was committed; and where death began there life arose, as the church sings in the preface of the Mass. Christ was not beheaded, nor His body dismembered; so are we taught that His mystical body, the church, should remain ever undivided. Christ bent His head to kiss us. Spread His arms to embrace us, and opened His heart to love us (St. Augustine). The heart of Jesus was opened that its wounds might reveal to us the hidden wounds of His love for us (St. Bernard). It was not the soldiers, but His love for us which nailed Christ to the cross (St. Augustine). During these three hours the sun was darkened over the earth, though an eclipse was impossible at the time of the full moon. As St. John Chrysostom says, the sun hid his rays that he might not behold the sufferings of his maker. The darkening of the sun is mentioned by heathen writers. 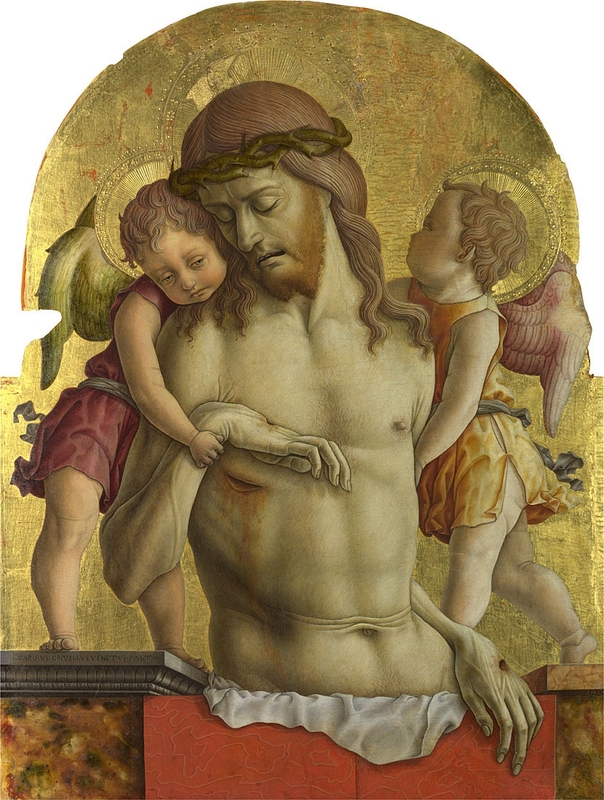 The dead Christ supported by two angels Carlo Crivelli. At the death of Christ the earth opened, the rocks split, the veil of the temple in Jerusalem was rent from top to bottom, many of the dead arose from their tombs and appeared in Jerusalem. All creation was in sympathy with Christ, excepting man, for whom Christ was suffering (St. Jerome). These marvels caused many to acknowledge the Godhead of Christ, as in the case of the centurion who exclaimed "indeed this was the Son of God". One may still see on Calvary a rent in the rock between the site of Our Lord's cross and That of the thief on His left. "Today thou shalt be with me in paradise"
"Father into Thy hands I commend My spirit"
The great cry which Christ gave before His death was a sign that he gave up His life of His own free will, and that he had strength enough to go on living. The cross as St Augustine says, is no longer the instrument of Christ suffering, but the pulpit of Christ preaching: from it He teaches the lessons of love of our enemies, gentleness, patience, obedience, God's mercy, goodness, justice and power, the immortality of the souls, the Last Judgement and the resurrection. Since Christ crucified His Flesh for our sins on that day the Church has forbidden the eating of flesh meat. On Friday of Holy Week the Church is in mourning: the altars are stripped, the lights put out, and the bells silenced, and the sacred ministers in their black vestments lie prostrate at the foot of the altar. The celebrant prays for all conditions of men, even for heathens and Jews, since Christ died on this day for all men. The crucifix is unveiled and the celebrant lays it, head towards the altar, on a cushion upon the floor of the sanctuary. He venerates and kisses the feet of the corpus on the cross. All present come up in turn to offer the same homage. On Good Friday there was no Mass, so called, but ceremonies entitled the Mass of the pre-sanctified. In the evening Our Lord's body was taken down from the cross and laid in the grave which belonged to Joseph of Arimathea. 4. During Easter Saturday, that is, on the greatest feast day of the Jews, Our lord remained in the sepulchre. On Holy Saturday, fire is struck from a flint, and blessed outside the church doors, and from this fire the triple candle, the paschal candle, and the sanctuary lamp are lit. Each branch of the triple candle is lit separately, one at the door, another in the middle of the church, and the third in front of the high altar, to represent the gradual knowledge of the Blessed Trinity. The paschal candle is also blessed on this day, and the five grains of incense imbedded in it reminds us of the wounds of Christ. The baptismal font is also blessed, a relic of the times when the catechumens used to be solemnly baptised, and solemn high Mass follows. 5. Immediately after the death of Christ His soul went down in triumph into the place where the souls of those justified under the Old Law were detained. This place is called Limbo, and is quite distinct from Purgatory, though the two places had this feature in common, that in neither place is there the vision of God; for while there is pain to be suffered in Purgatory, there was none in Limbo, nor was Limbo the same as Hell, where the pains are eternal. In Limbo entrance to heaven was deferred, there they longed for the Saviour to come and open to them the gates of Heaven. 6. On Easter Sunday before sunrise Christ rose glorious from the tomb by his own almighty power. Christ often foretold that He would rise again on "the third day". He appeared first to His Holy Mother (St. Ambrose) and early on the morning of Easter Sunday appeared to Mary Magdalene by the sepulchre. St Peter was the first of the apostle to see the risen Lord. In the evening He appeared to the two disciples on the road to Emmaus and immediately afterwards to the assembled disciples in the cenacle. He ate fish and honey in their presence and afterwards gave them the power of forgiving sins. The resurrection is a most undoubted fact. The death of Christ was officially verified and reported to Pilate. His holy Mother and friends would not have placed Him in the tomb unless He had been dead. Christ rose again to prove to us that He is God, and that we too are to rise again. The risen Lord bore in His body the five wounds, and it had the properties of agility, subtility, clarity and impassibility.